This is a family favorite! 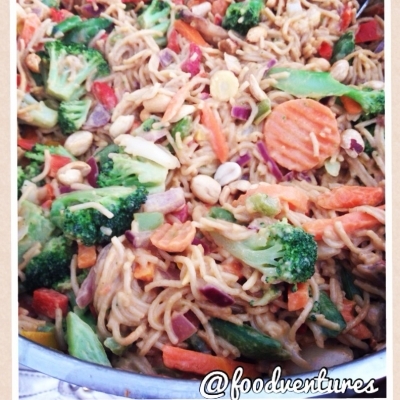 Whole grain spaghetti with mixed veggies and a homemade peanut sauce. 1) make your pasta according to the directions on the pasta. set aside once finished. 2) in a separate sauce pan (make sure itâ€™s fairly large), combine your onions (green, red, white) and garlic with olive oil and saute until your onions start to turn translucent. add your ginger and chili powder and mix well. 3) add in your frozen vegetables and peppers and cook until your frozen vegetables begin to soften (~5 minutes or so).